Who was this Gerald Byron? Does anyone really know? Gerald Byrons' early years could be summarized by having a propensity for engaging in a series of self-destructive activities that would have negative repercussions both to himself and those around him. This could be said to have come from his pervasive sense of his own mortality and a premonition that death was never too far off. But there was an addiction far greater than anyone else would dare to embrace, his addiction to paint. And just as other highly creative types throughout history he seemed obsessively driven in his pursuit of his art, he ate and slept painting for weeks at a time and ultimately for years. Françoise at the time could never understand how or why her husband could completely shut himself off from the world and his immediate family for long periods. As with everything else in life it came at a price. By doing so his decision would have grave consequences and cause great hardships in the latter part of his life. Françoise did fully accept the emotional and psychological stresses he put on himself and others. On the other hand, there was a need for her to create an emotional balance and a sense of stability between she and her husband. In the end all she achieved was to render herself ineffective, emotionally out of balance and powerless. Gerald had always been aware that he suffered from a serious heart condition. It was obvious to him that it was becoming more and more severe in the last four years of his life, from 1958 to 1961. His illness had rendered him unable pursue his career as an architect or photographer and his only viable way of earning an income was the occasional odd job. 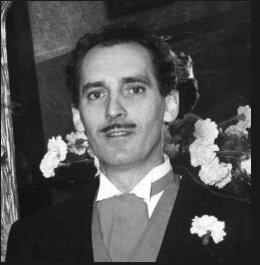 His friend and confidante Marc-Aurèle Fortin encouraged him to explore painting and threw his wholehearted moral support behind Gerald. Françoise recalled periodically both Gerald and Mr. Fortin would proceed to one or the other's residences in Montreal or St. Rose and seclude themselves in each others studios. Their motivation was to paint, get intoxicated and engage in a friendly competition. At the conclusion of these nights, they would almost always erupt in a war of words. Both argued who was more inaccurate in their painting skills. As usual, after every one of these occurrences, they continued to be the best of friends. But not before the destruction of some of the artwork had occurred. Each would destroy the other's artwork and, on occasion, even got into paint fights with each other. For Françoise it was equally humorous and frightening.